Choosing a company for outsourcing your transcription or subtitle projects can feel like a big decision. At Capital Captions we understand that our clients may have several queries before submitting work to us. Please find below some frequently asked questions to put your mind at rest and help learn more about our company. If you can’t find the information you are looking for in the FAQ’s, please contact us directly.  How does Capital Captions differ from other companies? *We listen to our clients. Our goal is to accurately transcribe sound to text, in a way that meets our clients' requirements and is fit for purpose. English subtitles for translation are written and styled very differently to closed captions for the deaf and hard of hearing. * We are honest with our clients. Our turnaround times can be expedited on request. However, our priority is to create and deliver top quality captions and documents which stand the test of time. We are reliable and always complete work within client deadlines. Similarly, will come to a solution if a timescale is unrealistic or may compromise quality. *Our ethos is first and foremost to respect and consider the end users of the content we create. Capital Captions take pride in producing highly accurate, well written subtitles and closed captions. We work using our initiative and are willing to spend extra time making sure nothing is missed. This ensures we deliver the best possible closed captions and subtitles for video content across ALL audiences.  How are your transcriptionists, typists and subtitlers vetted? At Capital Captions, our freelancers are required to have a minimum of two years experience within their specialism (e.g. medical, financial...). 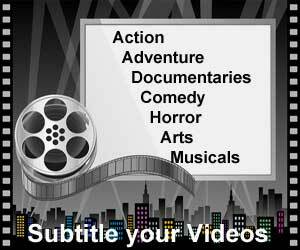 In addition, we require two years subtitling, closed captioning or transcription experience. An audio transcription and/or video subtitling test is provided to applicants. Grammar and research skills tests will also need to be completed. For ongoing work, we carry out regular and randomised proofreading checks on typists' and subtitlers' work to ensure that quality is kept high. We give both constructive criticism and praise to our subcontractors based on our quality checks and even more importantly, feedback from our clients.  What are your turnaround times? Urgent turnaround times start from less than five hours, and finish with our budget option (often used by students) of a one week turnaround. Turnaround times can depend on the length of video/audio files as well as the complexity of the work required. For instance, it takes longer to create closed captions from scratch as opposed to having a standard intelligent verbatim transcript to work with. Our super urgent transcription service is not always available so it's important to get a quote with us beforehand to check we have staff capacity for urgent transcription work.  How do I know whether I need subtitles, closed captions or transcription? * Closed captions consist of text that appears onscreen during video, film or television footage. Also known as Subtitles for the Deaf (SDH), closed captions are aimed at deaf or hard of hearing audiences to enable full access to sound within a video. They aim to put speech and audio into context, improving understanding, resulting in a better viewing experience. Unlike subtitles, they include sound effects, speaker identification, vocalisations and forced narrative. Closed captions are typically provided in a format that is either broadcast separately or encoded onto video at a viewer's request. * Subtitles consist of text that appears onscreen during a video, film, television footage or animated presentation, such as a PowerPoint video. They are aimed mostly at foreign audiences and can also be used by companies to help enhance search engine optimisation (SEO), making online video content searchable in text form. Subtitles are burned onto video, and are activated by viewers. * Transcription is the process of listening to audio or video and accurately typing what is said. Transcripts are often used for reference or research purposes. Different types of transcription are available including intelligent verbatim (where repetitions and um's are excluded); verbatim (where repetition and um's are excluded); discourse analysis (including nuances of speech, e.g. pauses, laughter, coughs, etc) or time coded where time is noted at intervals as requested.  How do I upload my documents? You can upload your documents via our secure DropBox account using the Upload logo on the right hand side of the site. Simply click on upload, select your files and send.  Can I upload my documents from a smart phone or tablet? Using a DropBox account for file transfer means that clients can easily install the app on their smartphone, iPhone or tablet, as well as work direct from the site using their device. We are happy to accept files by other means which include YouSendIt, WeTransfer, direct via email, or via web links. Whatever your preferred closed caption or transcription file sharing method, we're happy to work with you.  What are the payment options available to me? Capital Captions accept payment via PayPal, BACS transfer or cheque. For companies and regular clients, an invoice will be generated at the end of each calendar month with payment terms of 14 days. For individuals, we typically require 100% payment in advance, prior to commencing work.  How does Capital Captions ensure security and confidentiality of my data? * We are registered with the Data Protection Act. * All freelancers are required to complete Confidentiality agreement prior to commencing work with us. * File transfer is via our secure FTP DropBox. DropBox uses Secure Sockets Layer (SSL)/Transport Layer Security (TLS) during file transfer. It also uses 256-bit Advanced Encryption Standard (AES) for files during storage. A login password is used by Capital Captions and on receipt of files, a link code is sent to the client which allows them to view ONLY their own files and information. All our subtitle writers and transcriptionists are required to sign a confidentiality agreement before any work is undertaken. If you require more information on our services email us at info@capitalcaptions.com.